This is the line I hear in my head in my mother’s ANGRY voice (she is the sweetest person ever, so usually whatever I did deserved the angry tone) every single time I see an open ended comment box on a survey with the heading “Explain.” I’m immediately shot into a zone of feeling defensive, like I’ve done something wrong and need to defend my honor. The feeling is not warm and fuzzy, it makes me feel borderline offended. “Here I am trying to give you feedback and you’re asking me to EXPLAIN myself? Forget this.” Then I close the browser. On the other hand, when a company does a good job rewording the “Explain” question type, I have a completely different reaction. The question, “What kind of change would you make?” makes me feel like they genuinely care about my feedback, and like they’re really listening, which makes me more likely to give detailed in depth feedback. Weird right? At first I thought it was just me, then I tried a little experiment. When conducting our latest Pareto Principle based remote user research study, we asked the question, “What kind of change would you make to the product area you identified?” rather than just going with “Explain.” What we were looking for was for the users to give us more detailed information so that we could uncover the specific problems they were facing with the current solution. Any guesses on the completion rate for feedback when when I worded it the warm fuzzy way? No? 100 freaking percent! How crazy is that!? Every SINGLE respondent gave us a big old paragraph of feedback, and several of them thanked us for asking, and for being so in tune with our users needs! I mean, I have the best users in the world, but I almost fell down when I saw the difference in completion rate! 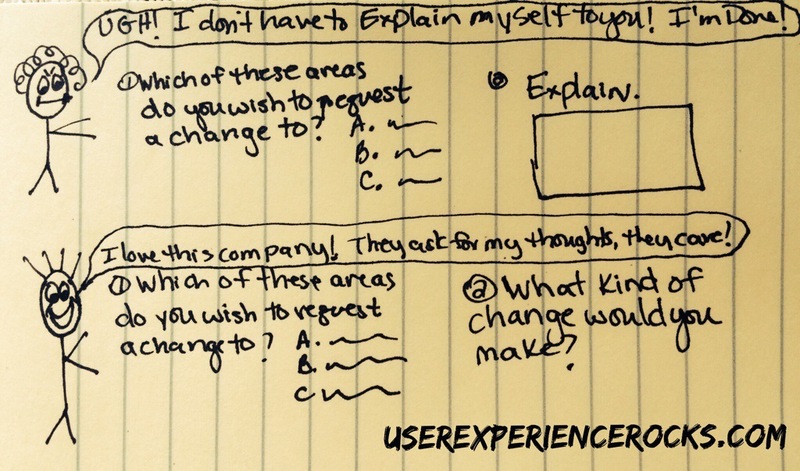 So the moral of this story is, don’t ask your users to “explain themselves” when you’re conducting user research. Ask them how they would change things to uncover the underlying, deeper issues they’re encountering. It’s kind of magical, you’ll end up with amazing data, and happier users who feel well taken care of! Why couldn’t I come across this listing months ago when i was on the lookout for it. Anyway, I’m glad I have it now. Many thanks for sharing. You’ll have bad ideas and great ones. Iteration = Innovation!